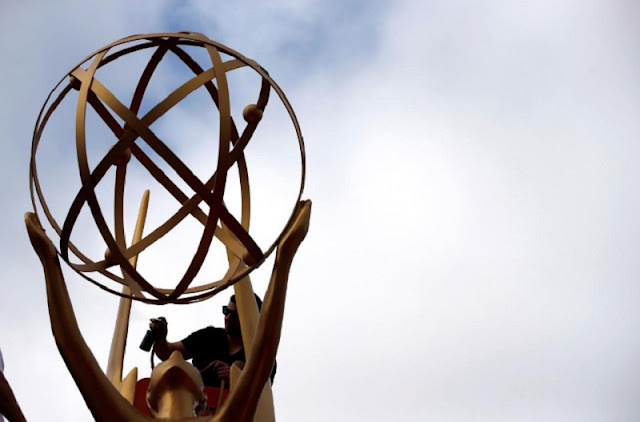 A worker touches up an Emmy statue during preparations for the 69th Emmy Awards at Microsoft Theater in Los Angeles, California, U.S., September 12, 2017. LOS ANGELES - “Saturday Night Live” found laughter and lampoonery in America’s fraught political and social scene and on Sunday the satirical sketch show looks set to reap the benefits at the Emmy awards, the highest honors in television. Led by Alec Baldwin’s withering impersonations of U.S. President Donald Trump and Melissa McCarthy’s winning turn as former White House spokesman Sean Spicer, the show earned 22 Emmy nominations after its most-watched season in 23 years. Kate McKinnon is competing in the supporting actress race for her spoofs of former presidential candidate Hillary Clinton and White House aide Kellyanne Conway on the live show that airs on Comcast Corp’s NBC. “The biggest TV star of this year is undoubtedly Donald Trump. No one’s close,” quipped Colbert ahead of the ceremony. “Veep” could also be a repeat winner for best comedy series, with actor-director Donald Glover’s hip-hop themed “Atlanta” and contemporary African-American family show “black-ish” seen by pundits as its closest rivals. Two-time Emmy champ “Game of Thrones” is out of the running this year because of a later broadcast date for its seventh season. Sunday’s red carpet turnout will feature a slew of A-list movie stars who are flocking to the small screen and the more than 400 scripted shows on cable, streaming platforms and broadcast television. Nicole Kidman’s battered wife in HBO’s “Big Little Lies” is seen as leading the limited series category that features three other Oscar winners: Reese Witherspoon (also for “Big Little Lies”), and “Feud” co-stars Susan Sarandon and Jessica Lange. The Emmy awards will be shown live on CBS television starting at 8 pm ET/5 pm PT. “Saturday Night Live” found laughter and lampoonery in America’s fraught political and social scene and on Sunday the satirical sketch show looks set to reap the benefits at the Emmy awards, the highest honors in television.